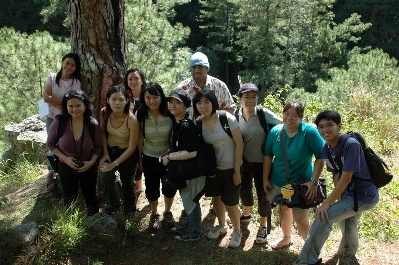 Eighteen students from the School of Arts and Social Sciences, along with 2 chaperones had a taste of the Philippines when they had a study tour from 12 to 21 December, 2007. 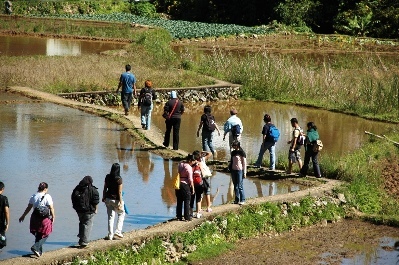 The study tour was hosted by the Cordillera Studies Centre of the University of the Philippines, Baguio city campus. 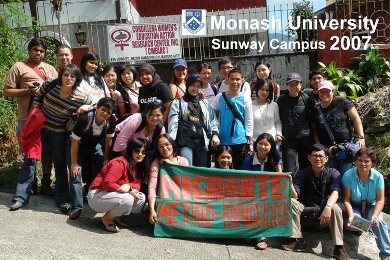 Five knowledgeable and enthusiastic student guides from the University of the Philippines accompanied the Monashians. The 10-day trip saw the student travelers visiting two urban centers in northern Philippines. Situated at 5,000 feet above sea level, Baguio City is known as the ‘Summer Capital of the Philippines’ because of its cool temperate climate. 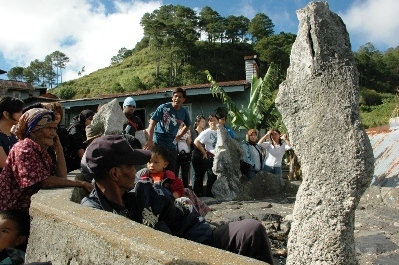 Sagada is a scenic hamlet situated further north in the Cordillera mountains. At the Cordillera Studies Center, the travelers were given an introduction to the history, socio-political and economic background of the Cordilleran region. They also had interesting dialogue sessions with the Cordillera People’s Alliance (CPA), an NGO working with the indigenous peoples in the region; Northern Dispatch Weekly (NORDIS), an independent community newspaper; ORNUS, an NGO supporting the rights of the urban poor; MIGRANTE, an NGO monitoring the plight of Filipino migrant workers abroad; and the Baguio City Muslim Association. The fourth day of the study tour saw the students travelling some 5 hours along spectacular mountain roads to Sagada, a spot popular for eco-tourism. Besides meeting up with the Montanosa Research Development Centre, an NGO working for sustainable agriculture and speaking to local community leaders about indigenous peoples’ beliefs and practices, the travelers had time to do some hiking to see the famous hanging coffins, rice terraces, and spelunking at the Sumaging Caves. In his reflections about the trip, Dr Yeoh Seng Guan, the organiser, said: “If there are any learning points that my fellow travelers can discern from this year’s trip to what may seem to be exotic and unfamiliar worlds, I believe there are two. Firstly, it is the tenacity of the human spirit in search for better livelihoods as embodied in the courageous daily struggles of local communities and civil society groups. Secondly, the singular wisdom and necessity of valuing and protecting cultural diversities wherever they may be found in order to shape a more convivial place for all”.